Thanks to Daniel 'dudefather' McFarline for sending me that. You may remember dudefather as the same fellow who sent me all the Friday the 13th movies. I am fairly certain that he is approximately six million times better than me as a person. So, what have we here, then? An advert which, if there is any justice in this world, is still haunting the artist to this day. I mean, look at it. If you were a responsible parent, in what circumstances would you allow a fat moustachioed man anywhere near your child while she or he is bathing? On second thoughts, maybe I don't want to hear the answer to that one. 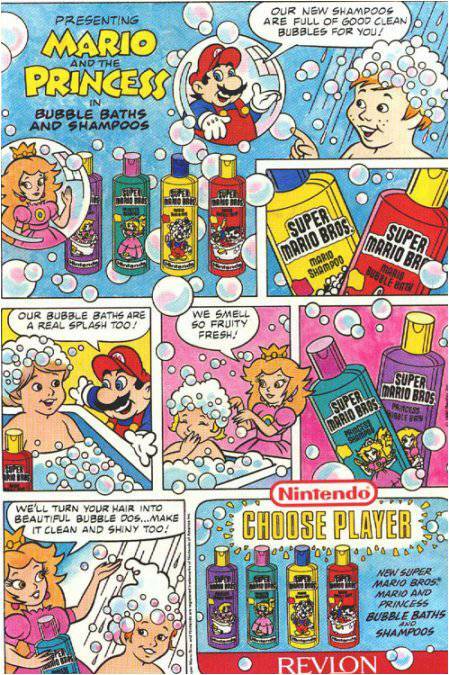 I also like how Princess Toadstool is suddenly just "The Princess". She don't need no stupid name! She's just Generic Love Interest and part-time Generic Kidnap Victim. Congratulations on setting the feminist movement back another ten-odd years. I would, however, like to know exactly what she's staring at in the first panel. I like to think it's a vegetable that has grown into a rude and amusing shape. 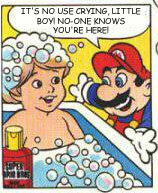 Actually, slightly more importantly, what the hell is Mario staring at in the second panel? Even more importantly, what are his hands about to do? Is it any coincidence that this is the last time we see him in the comic? No doubt the cameras went off him hurriedly and he was forcibly dragged away before he could traumatise any more youngsters with what he likes to call his "magical warp tube". I'm sorry, that was uncalled for. I probably shouldn't read too much into a badly drawn advertisement for an ill-advised merchandising venture from the late 80's/early 90's. It's all fun now pointing and laughing at ridiculous stuff from the past, when people in the future are no doubt laughing at us even as we speak. 80's: Ha ha ha! Look at those stupid flares the 70's are wearing! 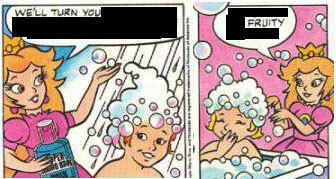 2000's: Jesus, look at this comic! what a load of tossers everyone was in the eighties! 20?? 's: Boy bands? War over oil? Tamagotchis? I'm so glad we grew out of that awkward phase! 3000000's: Do you remember what tossers we were before we were an emotionless hive mind? Ha, ha, ha! On that thought, I leave you.